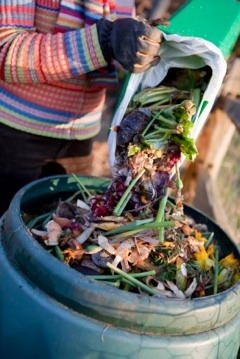 Home composting recycles biodegradable materials into rich, nutrient filled compost right at home. Start composting today and reap the benefits of recycling at home. A super easy and inexpensive way of going green at home. Whether you live in a condo or on an acreage you can turn household and landscaping scraps into gardener's gold. Not only do natural biodegradable materials break down quickly in a composter, the by product left behind is actually beneficial to the earth. A no brainer really. Instead of filling your trash up with kitchen scraps then tying them up tightly in a plastic bag to rot in a landfill for years before they are incorporated back into the earth (where they should be), here's a better idea. Set aside a container to collect kitchen scraps and compost them along with any yard and garden waste your household yields. Our easy home and garden composting tips will help you to produce an odour free, nutrient filled growing medium that can be put back into the earth or used in pots to nurture a new generation of healthy vegetables, flowers and trees. Just the way it was meant to be. Starting at the beginning, our what is compost page describes what compost is and how to use it to enhance your indoor and outdoor gardening efforts. Learn how to compost successfully with a few essential tips to keep moisture and temperature levels ideal for the composting process. Some kitchen scraps are compostable and others aren't Here's a list of suitable kitchen compost materials and what you should avoid putting into your kitchen composter to get a clean, moist and odor free, end product. You can buy a ready made garden composter online or at most nurseries and home centers. Not all composters are created equal, some get too hot, others get too wet and still others don't allow essential air circulation. The composter must maintain a certain internal climate for the materials to decompose into a useable soil. Of all the available types of home composters, compost tumblers are the most highly recommended by consumers. The tumbling action evenly distributes moisture and produces a finished product with less effort, and in less time than open piles take. If you have a small space to devote to your composting endeavor one of our top recommendations is the compost tumbler. Our other recommendations for small space composting are building a worm farm or buying a Bokashi Bucket - SCD Probiotics K100 All Seasons Indoor Composter Kit . Here are some great tips on how to make a composter big enough for yard and garden clippings as well as your kitchen scraps.